GFI the makers of MailEssentials, FaxMaker, LanGuard and one of my old-time favorites Pop2Exchange just to name a few are giving away this new tool to let you check how much info your systems are advertising about themselves. The tool can probe a single machine, a list of machines a or even a whole subnet. It is a great tool. I have been using Gibson Research's free web tool Sheilds Up, but it only will check the machine you are currently running it from. The GFI Scanner is a Network Tool as opposed to a Machine Tool. It goes out and inventories the address range you give it. GFI did not want to hold up the release of their Scanner as "Security Breaches" are on the rise, so it may be a little while before the online manual is posted, but they assure me it will not be too long. Of course GFI would like you to buy their products. Of course some marketing guru probably thought this up. But it is a great tool from a great company. Take advantage of it. If you like their work go to their website and buy some great software. In the old days we had really great Freeware and Shareware because honest folks did just that. Nowadays with all the time bombed "Teaseware" we see more and more junk out there. Here is one from in front of the firewall, the idea is to publish as little as possible. London, UK, 8 August 2001 - GFI, leading email and network security software provider, has launched LANguard Network Scanner, a security scanner to audit network security. In its bid to promote network security, GFI is offering this version as freeware. 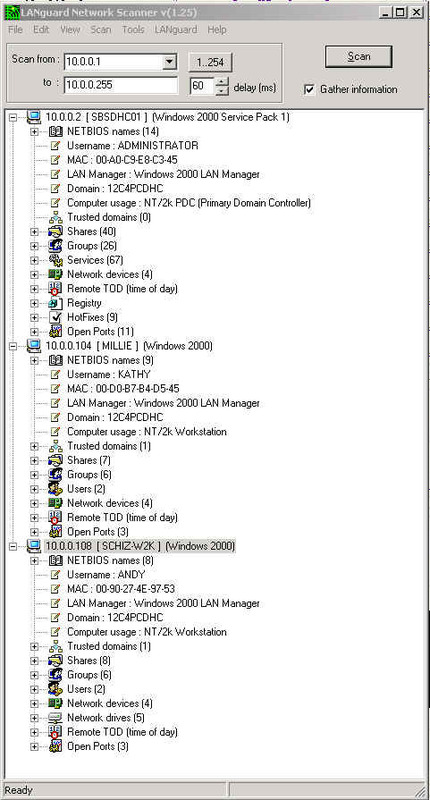 LANguard Network Scanner can be used to make a network security inventory. It detects unnecessary shares, open ports and registries that are not secured, and check whether the operating system (OS) is 'advertising' too much information. It also does OS detection, password strength testing and much more. It scans an entire network based on an IP range, and compiles all the information in a HTML report. There are various commercial security scanning tools on the market today; most use a database of known security holes, for which they scan the network. Yet, because of the number of security issues discovered daily, these database-based products are almost immediately out of date. With LANguard Network Scanner, GFI avoids this pitfall because the product innovatively allows the user to scan the network from a hacker's perspective. This way, LANguard's security scanner identifies all machines, their NETBIOS info, open ports, shares and more, giving exactly the same information that a hacker would have. With this information, LANguard Network Scanner users can proactively secure their networks by shutting down unnecessary ports, shares, and so on. "Security breaches are on the rise. The Computer Security Institute survey issued last year, for example, reported that 90% of organizations experienced computer security breaches in the previous 12 months. GFI's goal is to help combat this," said Nick Galea, GFI CEO. "LANguard Network Scanner, which we are currently offering as freeware, will help companies implement basic security." * LANguard Security Event Log Monitor - provides intrusion detection through centralized NT/2000 security event log monitoring. * Three freeware products, LANguard Network Scanner, LANguard Port Scanner and LANguard File Integrity Checker. for Windows by Microsoft Corp. and CMP Media.